Battlefield Ukraine is the type of novel I would not mind writing – and perhaps I will write one day. So this is a high compliment (IMHO). After over fifteen years of the war on terrorism, most novels are focused on counter-terrorism operations, Islamic extremism, espionage, and other small-unit / small scale conflict. 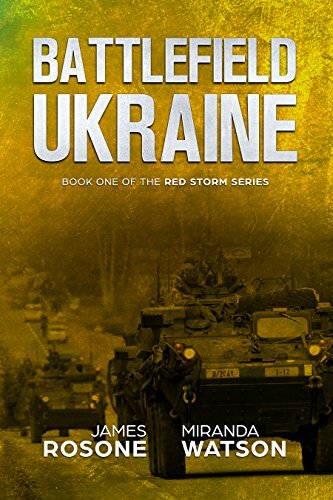 This novel aims to follow in the footsteps and style of Tom Clancy’s Red Storm Rising, Harold Coyle’s Team Yankee, Bob Forrest-Webb’s Chieftains, and Larry Bond novels. It does a good job, bearing in mind this genre has some limitations. Most importantly, while this novel has similarities with Red Storm Rising and similar books, it is an important political and technological update. Red Storm Rising is quite dated with references to SM-1s, F-14s, F-19 stealth fighters, etc. Also think about what that novel does not have: B-2 bombers, F-22s, F-35s, Javelins, GPS, JDAMs, etc. These novels are action and equipment oriented and cover the whole spectrum of warfare, from the trench to the President. They are not character driven except for a few characters who get a bit more page space than others. This genre of novel simply cannot be a spiritual journey of redemption and discovery as they usually cover the perspectives of both sides and different military occupations (armor, infantry, aircraft pilot, intelligence analyst, spy, political leader, etc.). And, frankly, I do not read these books for their “characters” but for the action and the fictional portrayal of force-on-force war. Other books or types of books will cover one man’s search for himself amidst war and tragedy – but these will be focused on that person, and not cover dozens of aspects of warfare and geopolitics. This novel portrays a full range of combat operations on both sides: armor, helicopter, air supremacy, air defense, naval, infantry, etc. One can easily ask for more of one or another aspect; for example, Red Storm Rising focuses on the ASW aspect much more than this novel. But this novel is not 1000 pages long, and nor should it be. The authors have attempted to assess the outcomes of a force-on-force conflict both at the tactical level (how will tanks with active defenses fare against ATGMs and sabots, or how will stealth aircraft do in a radar/AA rich environment? ); to the operational (the maneuver of brigades and divisions, though this is a bit less emphasized); to the strategic: reinforcement rates, logistics, politics, etc. For any critics who think the story is fundamentally unrealistic, they should research any current study by RAND, NATO, or any other credible source which has clearly assessed that Russia will likely be able to overwhelm NATO if it launches a full offensive in the Baltics or (presumably) Ukraine. The reason is simple: Russia can assemble several hundred thousand troops, equating to several armored and mechanized infantry corps, while NATO can only assemble in the same time period at most two to three divisions. NATO is working hard every day to deal with this mathematical reality. One reason that a person reads this type of novel, in addition to the “action” is to be exposed to and learn more about various weapons systems. The novel does a good job of this, introducing some aircraft and weapons that I know less about, some that are a bit creatively “fabricated” (which is fine, as new weapons get produced all of the time), and how weapons that I know well and have worked on in some way are presented. I read this novel in about 3-4 days. It was a good page-turner – in part because this is my preferred genre, but also because it was good enough that I had no reason to not enjoy it. It was not the type of novel that I kept reading simply because I had started it. I genuinely enjoyed it, and was always curious what would happen in the next battle. This novel hits on some of my personal “pet peeves” effectively – even beating one of them to death. I have continuously said that the Global War on Terror has degraded the US conventional warfighting ability at all levels (intelligence, logistics, combat operations, soldier skills, etc. Obviously, I’m not the first one to say this. This novel repeats this point several times. Second, I have also said (and here again, I’m not alone) that a peer-on-peer war will make the wars in Iraq and Afghanistan – and even Vietnam – seem like a vacation. This novel suggests in a few weeks fighting some 8000 American killed – obviously a lot compared to eight years in Iraq and 15 in Afghanistan in which not even this many have died. Another interesting aspect of the novel is that it suggests that the war would have “limitations”. We do not know if this is true, but it is likely. Both sides would not only try to prevent a nuclear weapons exchange, but there would be various unwritten (or even secretly agreed) rules about what to strike and not strike, and where. Almost war is fought with unspoken limitations. (We will see in the next novel, Battlefield Korea, that these limitations are reduced a bit). The novel has a few minor reaches and inaccuracies. The UN would not authorize a resolution concerning an independence vote nor provide monitors in Eastern Ukraine because the US and probably other countries (even China) would veto such a resolution – it only takes one Permanent 5 veto to block a Security Council resolution. Second, while the novel states that the bulk of both sides’ military satellite systems are attacked and/or taken down, there seem to be no problems flying Predator/Reaper style drones. Moreover, the novel does not address the potential of drone controls being jammed (and most military planners do not expect to use drones in a peer combatant battlespace). Finally, it lacks any mention of refugees or considerations of civilian casualties by either side. The novel is also a bit wordy in dialogue, especially at the political level. There is a bit too much repetition of arguments and debates between characters. Not an overwhelming amount – but this novel would be tighter if some of the political dialogue was cut in favor of the “action.” I also think the “build-up” to the start of the war was a bit too drawn out. Most people are reading this book to read about war. It’s true that the start of the war needs to be explained and seem reasonable (and this novel presents a credible set of events that lead to war) but it could be shortened. There are a few areas where I disagree with the military assessment – but this is a judgment rather than an actual criticism of the novel itself. The Russians are portrayed as effective, efficient combatants at every level: naval, air, infantry, and armor. However, history, equipment, and training do not indicate such capability. Russians invest less in C3ISR, train less, the average soldier (airman, sailor, etc.) has about a quarter or less the experience and training hours as his American counterpart, and most of their equipment is actually not tested in “strenuous” combat conditions. I personally would expect many of their vehicles to break down, the T-14/T-15 Armatas to malfunction, and for the Russians to have a low sortie rate of aircraft. This may be pessimistic – but again, Russia still struggles with insufficient funds and mediocre training in part because of its reliance on conscription. And almost every conflict has revealed as many Russian failures as successes. Additionally, the novel does not adequately address some aspects of naval air defense (CIWS, chaff, Rolling Airframe Missiles), etc; counter battery fire is never mentioned (even though the author is a former artilleryman – ie. both sides shell one another at their leisure, it seems), and a hundred other military systems (ATACMs, WCMDs, MLRS, etc.). BUT this latter point is an unfair criticism – it is simply impossible to include every aspect of modern combat in a novel. Still, I would like to have seen some kind of advanced, area air-delivered anti-armor weapon. The WCMD, for example, was effectively used in northern Iraq in 2003, taking out a company or more in one airstrike. (Note: the next novel, Battlefield Korea, covers in greater detail ship defense systems). I am not convinced that in this situation a US super carrier would attempt to enter the Black Sea – and a quick internet search suggests that they have not ever entered the Black Sea (I’m happy to be corrected). It might have been more accurate to have had a MEF amphib enter the area – but here again, if war was really likely, it’s not certain that it would – for the very reason that the novel shows; vulnerability to sub and air attacks. Another issue is that the Russians seem able to mobilize and build up without the US assessing the build-up as a threat. Given the US has its own espionage systems, it is hard to believe that there would not have been a more rapid reaction earlier – such as deployment of more air defense, and earlier warning orders issued. Even now, whenever the Russians announce an exercise, NATO beefs up its forces a bit and presumably there is a greater concentration of ISR assets in the region. Finally – what’s going on in Kaliningrad? The question of a Russian-NATO conflict is valid, and the details of how it will play out are uncertain. Sceptics of this war occurring are ignorant about history. Wars have often been launched due to series of misunderstandings and miscalculations. However, it is likely (though there is no certainty) that the combined “might” of NATO – economic, population, industry, and military – would certainly defeat Russia. – eventually – depending on how “victory” and “defeat” are actually defined. Good job to the authors for tackling a complicated and massive subject and keeping it within a good number of pages and tight story. Well done! You can find the book on amazon.com by clicking on the link below.